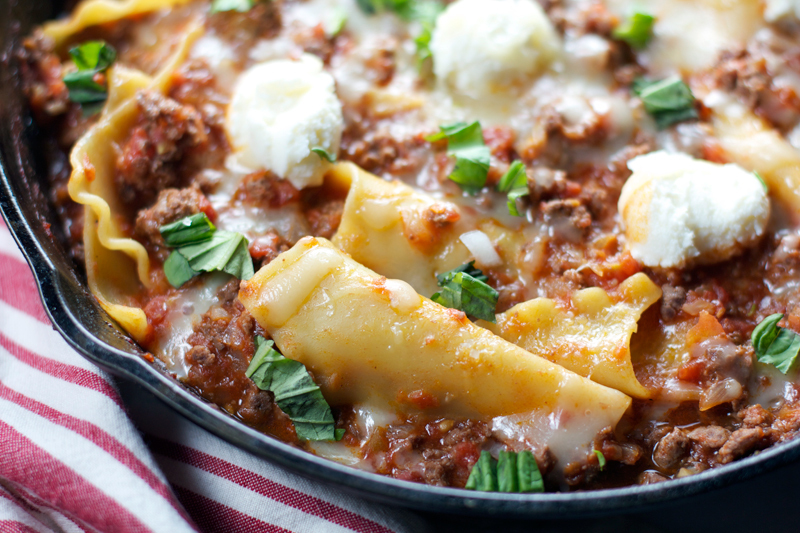 You just need one skillet to cook up this delicious lasagna dish. I love lasagna, but I don't love that most recipes take over an hour to bake and make enough servings to feed a small army. As much as I love leftovers, I don't want to eat the same thing that many times in a row. 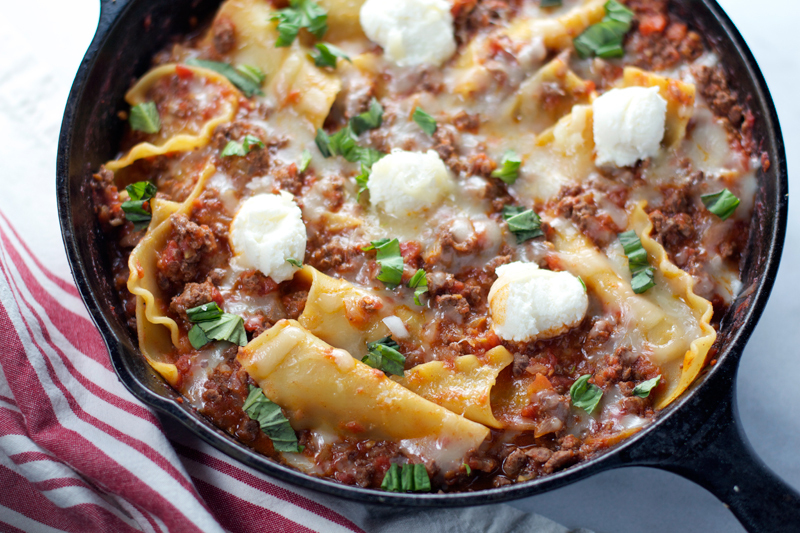 That's where this recipe for skillet lasagna from America's Test Kitchen comes in. It totally fit the bill for my ideal recipe – around 30 minutes to make and just enough extra servings for a few lunchtime leftovers during the week. 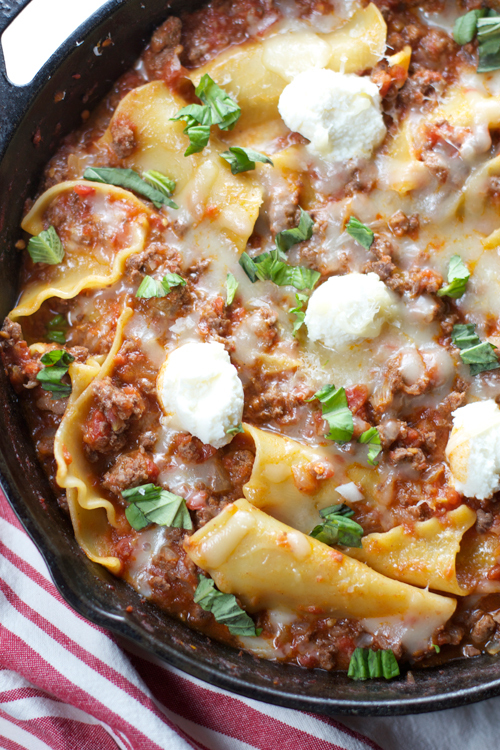 And, at only 30 minutes, this recipe is completely compatible with weeknight cooking, and a hearty dinner will be on the table in no time. 1. Add the whole peeled tomatoes and their juices to a food processor and process until no large pieces remain; about 12 pulses. Set aside. 2. Heat the olive oil in a 10-inch cast iron skillet over medium heat. Add the minced onion and salt and saute until golden; 5-7 minutes. Stir in the pressed garlic and red pepper flakes and saute until fragrant, about 30 seconds. Add the ground beef and cook until no longer pink, breaking it apart into small pieces with a spoon as it cooks, about 5 minutes. 3. 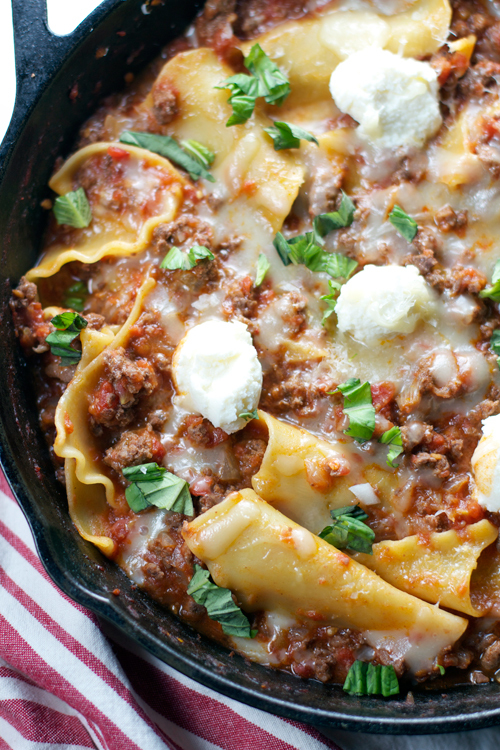 Place the broken lasagna pieces over top the meat, making a single or double layer. Pour the processed tomatoes over top the noodles. Cover, and increase the heat to medium-high. Simmer vigorously for about 20 minutes, or until the pasta is tender. 4. Turn off the heat and stir in half of the shredded mozzarella cheese and half of the grated Parmesan cheese. Season with salt and pepper to taste. Add heaping tablespoons of ricotta cheese over the noodles, then sprinkle with the remaining cheese. Cover and let stand until the cheese has melted, about 3 minutes. Scatter with minced fresh basil before serving.